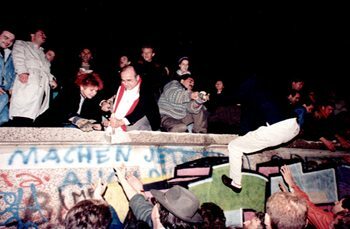 People who were old enough will recall powerful images of November 9, 1989, the collapse of the Berlin Wall. East and West Germans scaling the wall to embrace on ramparts that used to be laced with barbed wire. The concrete wall being torn down by any and all means: cranes, hammers and bare hands. What is often overlooked, is the sudden groundswell of public protests in the autumn of 1989. . This movement was “Die Wende” (the turning point) that led to the fall of the Berlin Wall and eventual German unification. Until that point, despite the opening of the USSR through Perestroika and Glasnost, and the thawing of Cold War relations, many European neighbors expressed strong reservations about German unification. Among them were British Prime Minister Margaret Thatcher and French President Francois Mitterrand who warned against the dangers of a rising German power. It was the “Friedliche Revolution” or Peaceful Revolution that tipped the scales. And at the heart of this revolution was the Protestant church. Until that point, the voice of civil society in East Germany was closely controlled. Even the sparse dissent coming from academia and intellectual circles was scattered. Furthermore, writers had to self-censor to survive the close surveillance of the Socialist Unity Party of Germany (SED). What the SED did not anticipate, was the voice of the Protestant Church. The prayer service became a safe and open place for East Germans to discuss their concerns. It was also a space for the Church to interface morals and ethics with social issues such as the rising threat of nuclear war and the stagnation of the East German regime. In the fall of 1989, the Monday prayers for peace burgeoned from hundreds to thousands. Führer recalls, “They (the people) brought the masses.” On October 9th, days after the German Democratic Republic government had hosted its 40th anniversary celebration, 70,000 thousand gathered. “The Church is only the church when it is there for others.” ~Dietrich Bonheoffer It wasn’t certain that the protests would be peaceful. Just a few weeks prior, protesters were beaten by the Statzi . Despite threats, pastors and speakers urged the protestors to remain peaceful. As the people flooded into Leipzig square, surrounding churches opened their doors to accommodate the overflow. The only weapons wielded by the peaceful crowd were candles and banners saying, “Wir sind das volk” (We are the people). That night, there was no violence. 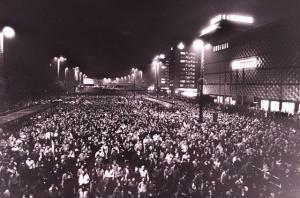 News spread through East and West Germany of the peaceful protests, and inspired others to follow suit. The protests, combined with the massive exodus of East Germans fleeing to West Germany through Hungary, forced General Secretary Erich Honecker to resign. By November 7th, the entire East German government resigned. On November 9th, the Berlin Wall came down. 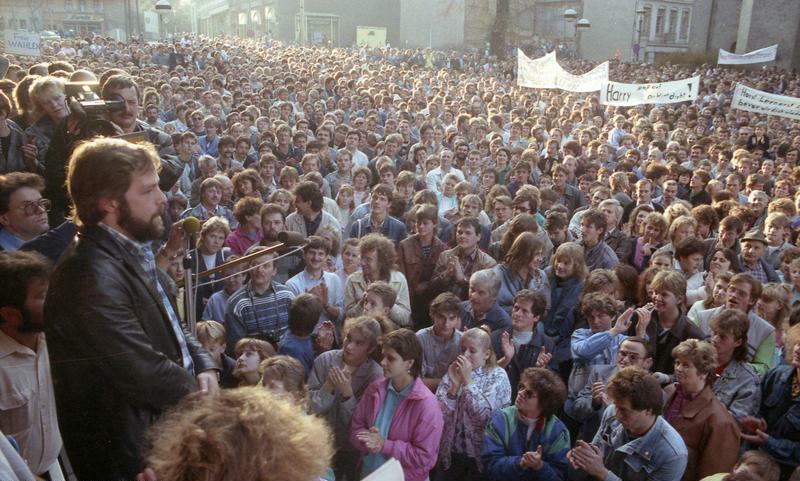 By March 1990, merely months after the fall of the Berlin Wall, East Germany held its first free multi-party elections, and seven months later, in October, Germany was officially reunited. Economic integration would take even longer; and according to Chancellor Angela Merkel, the “inner unification” of the two disparate cultures still continues. Nevertheless, the victory of the Peaceful Revolution was that “non-violent protests could fell a system of dictatorship most Westerners had believed unshakable.” (Civil Disobedience) Unlike the violent revolution in Romania, which left thousands dead, and executed the former dictator Nicolae Ceauşescu and his wife, the peaceful protests that swept through East Germany enabled a peaceful and swift transformation of the political system. The Peaceful Revolution was an awakening of East Germans to the ideal of peace. It was spearheaded by the Protestant ministers who were inspired by the example of other religious leaders like the pastors of the American Civil Rights and Dietrich Bonheoffer, who stepped out of the religious box and into the public square to engage the ethics of their faith in the social and political issues of the day. Today Leipzig is remembered as the hero city, “heldenstadt”. Roberts, A., & Garton-Ash, T. (2009). Civil Resistance and Power Politics: The Experience of Non-violent Action from Gandhi to the Present . Oxford University Press.